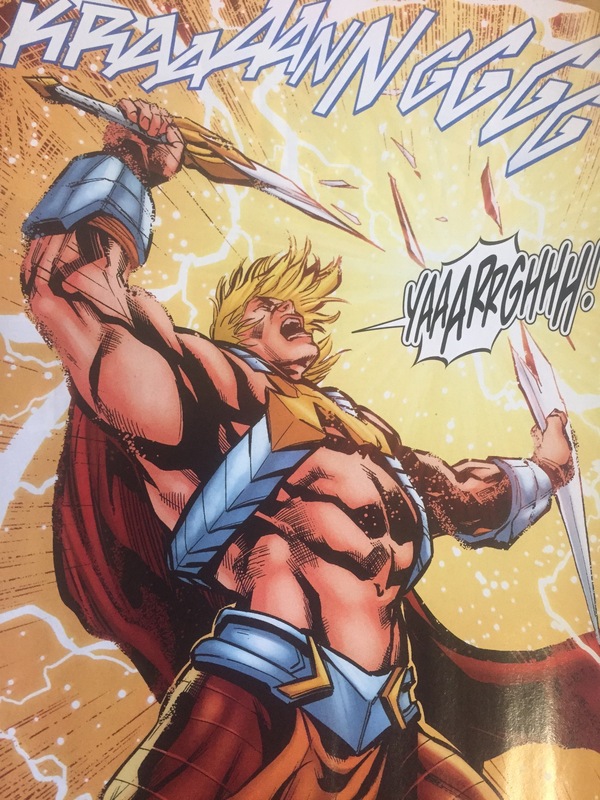 I have been very impressed with the current run of DC masters of the Universe. “He-Man: The Eternity War” has really been developed. And we are seeing the characters presented in ways we have never seen before. Here is a pic of all six issues I have. I have two of the covers from Issue 1. The version with the toys came only to subscribers, if I am correct. What is so impressive? Here are issue by issue thoughts. Issue 1. Hordak returns to flesh, using He-Man’s blood, drawn unintentionally by She-Ra in the preceding story arc. And then he becomes a super charged version of himself by tapping into the power of Grayskull. See what I mean…We’ve never seen Hordak presented like this. Issue 3. The deal with the Eyes of Grayskull returns from the digital-only books that began DC’s current run on Masters of the Universe. She-Ra finds the Eye of Chrono and unintentionally leads Hordak to it. Issue 5. Skeletor witnesses She-Ra use her sword to heal herself, and asks her to heal him. Then he explains that he has had a change of heart and doesn’t wish to be constantly defeated, as he has seen over and over in different versions of himself as he traveled the Multiverse. The Green Goddess (or Sorceress, or Teela, what should we call her now?) lets He-Man know that “The Goddess” (adding to the confusion) has three faces, Serpos, Zoar, and Horokoth. Eternia has witnessed the age of Zoar, but she fears the Age of Horokoth is inevitable. He-Man chooses to look at the future behind a door with the Horde symbol on it, (which means Horokoth, the destroyer now.) He sees himself as King He-Man, with the normal skinned (and naked) Teela as his queen. A military state is evident. Issue 6. 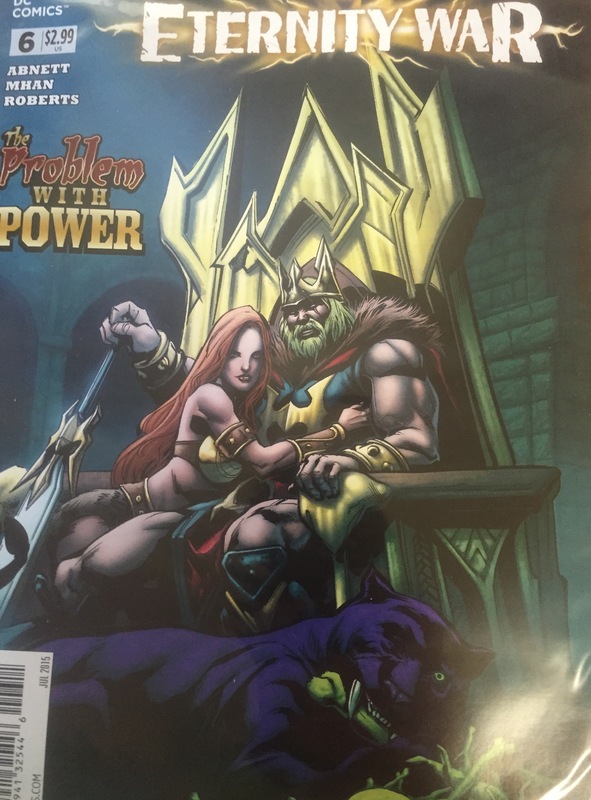 “The Problem with Power.” He-Man sees a vision of the future. DC uses King He-Man…an impressive draw to this story…the cover is magnificent. We see more of the kingdom that King He-Man will bring about. 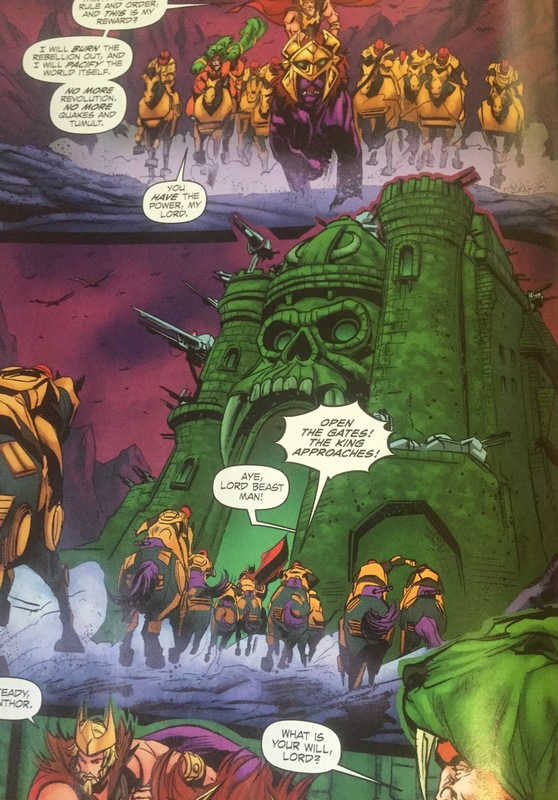 Notably, Skeletor’s allies are now his allies, while the “Good Guys” are now “The Great Rebellion!” At the end, He-Man breaks the sword in half, destroying it and relinquishing the power to return to the form of Prince Adam. I can’t wait for issue 7! “The Problem With Power” was the title of perhaps the greatest Filmation episode, where He-Man changes into Adam…a reverse transformation rarely seen, and then throws the sword into the abyss. 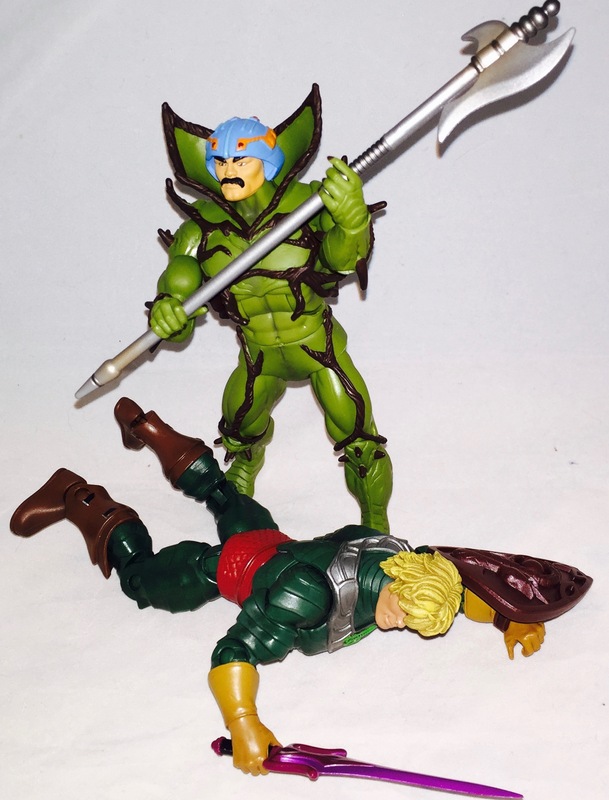 He decided in that episode that being He-man wasn’t worth taking the life of someone. 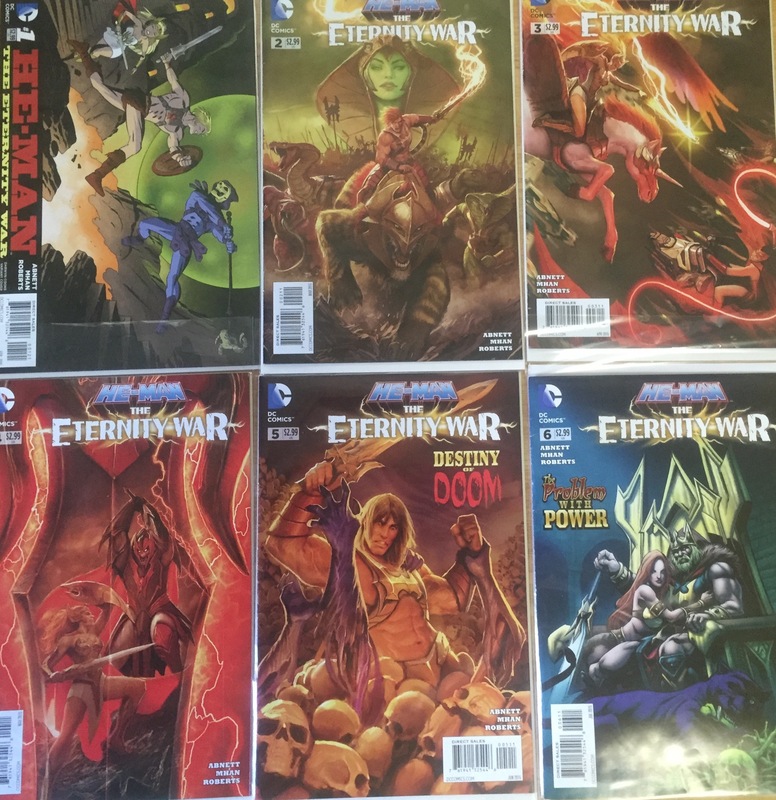 In this issue, there are echoes of the same, but all of Eternia is the victim as King He-Man is a despotic leader. He-Man destroying “The Sword of Eternity.” (A new name for “The Power Sword.” Christened thus for only a few panels.) a moving panel…Prince Adam appears so weak in the next few panels walking away, and I wonder how this is going to work. 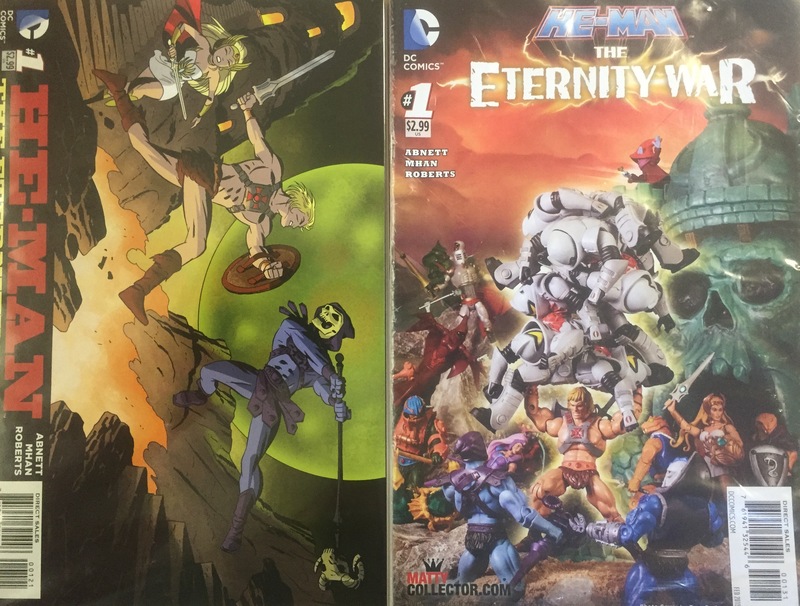 “He-Man: The Eternity War” is a terrific read, and keen fans will see little allusions and nods. 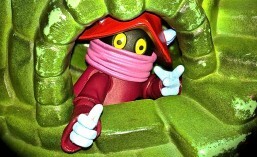 I see it as the comic writers have a box full of toys, and are constantly playing with them in new ways. Shaping a story the way little kids would have, and then making modern comics meant for an adult audience. I hope DC keeps making MOTU comics. I don’t ever want that dry spell that seemed to happen for so long to ever return. I want to see toy versions of these comics characters. The work is certainly deserving….